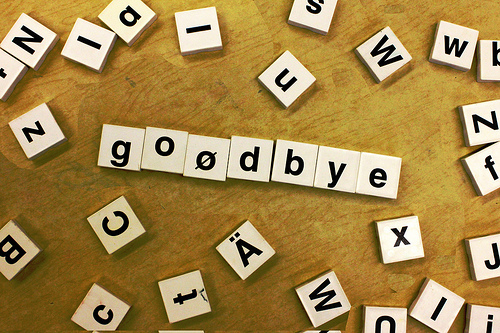 Breaking up is hard to do, and quitting your job is no exception. Whether you are leaving on good or bad terms, the act of resigning can be a difficult one. PayScale provides you with five easy steps to help make the departure from your current employer a pleasant one. 1. Giving Notice 101 – Remember not to jump the gun, here. Wait until you have double confirmation that your new job offer is 110 percent certain and a contract has been signed, sealed, and delivered. That last thing you want to do is prematurely quit and find yourself jobless because you a bit too quick to pull the trigger. It is customary to submit your resignation in writing (see “2. Letter of Resignation,” below) and in person two weeks prior to your anticipated last day at your current job. However, don’t be surprised if your employer chooses to have you escorted off the premises (yes, security guard and all) immediately upon you giving notice. Try not to take it personally. With that said, spend a few days discretely cleaning out your belongings prior to informing your supervisor of your resignation so that you aren’t put in the awkward situation of having your colleagues watch you pack up your desk with a security guard behind you. 2. Letter of Resignation – Keep your letter short and sweet and refrain from expressing any negativity whatsoever. Whether your departure is an amicable one or not, it’s essential to leave the company graciously without any bridges burned, because your paths may very well cross in the future. Please accept this letter of resignation from the position of [insert Job Title], effective two weeks from today. I would like to inform you that my last day at [insert Company Name] will be [insert Date: mm/dd/yyyy]. 3. The Talk – This step is the hardest part of “breaking up” with your current employer because it entails you explaining why they’re not good enough and that you’ve found someone new … or at least, that’s how they’ll take it. The best advice for “the talk” is to keep your cool, don’t fight back if there’s hostility, and express gratitude for all that the company has done for your career. Now for the hard part of “the talk”: Discussing your new job position. The rule of thumb is, again, keep it brief, neutral, and professional. Never boast! Also, the question of whether or not you’re leaving because of compensation will most likely come up, and it’s up to you whether you want to be truthful. There is no right or wrong answer to that question, it’s more a matter of whether your objective is to “cry wolf” in an attempt to be presented with a counter offer, or whether you’re leaving for a more promising future with the new company. The simplest answer is that you’re leaving to further your career, leaving any talks of money or compensation out of it. 4. Last Two Weeks – This step is applicable if and only if you aren’t kicked out on the spot after giving your notice. These last few weeks should be used to wrap up any loose ends with any projects you’re working on, clean up your desk and computer, train your replacement, and end things on a good note with your supervisor(s) and colleagues. It’s crucial to not act like these last two weeks are for slacking and talking about your awesome new job because that’s a definite way to sabotage your reputation with your current employer. Remember what we said about not burning any bridges, because it’s one of the best pieces of career advice there is. The business world is smaller than you think, especially in these days of social networking, so you always want to maintain a positive reputation throughout your career. 5. Stay Connected – When your last day approaches, it’s a great idea to handwrite thank-you notes to any and all managers, supervisors, colleagues, and clients, expressing gratitude and indicating that you wish to stay in contact with them after you leave the company. Social networking is incredibly beneficial for professional connections nowadays, so remain in contact with your former employer so that you can ask for a LinkedIn recommendation or referral later on down the line, if need be. You can also follow the company on social media to keep up to date on any new successes that you wouldn’t mind sharing with your network. Showing support on- and offline is a great way to maintain a positive relationship with former employers and colleagues. Now you have all you need to know to prepare for a gracious and amicable departure from your current employer, should the need arise. Do you have anything to add to the list of tips for resigning graciously? If so, share your thoughts on Twitter or in the comments section below. Pitcher Pays for Peace of Mind, Would You?